This collection features 39 original tunes, with fully-styled bowings and chords and bonus viola and cello transcriptions. Two are Max Cohen originals, three are co-written with Max and another is my Irish twist on a Jane Rothfield Old-Time tune. About half are recorded already, so a printed discography is included, with eight tune links to YouTube performances below. There are 16 jigs (three are crooked! ), 14 reels, 8 waltzes, and 3 airs, in styles from all over the fiddling world. My Old-Time reel, Brasstown and the Celtic air, Raven’s Wing, co-written with guitarist Max Cohen, have made their way into the fiddling canon, encouraging me to send these other tunes out into the world. The collection is dedicated to Bob McQuillen, prolific tunesmith and mentor. I want my music to help people. So, if anyone wants to record one or more of these tunes, I request they make a donation (in lieu of royalties) to their local non-profit that feeds the poor or shelters families from domestic violence. Contact me for details. 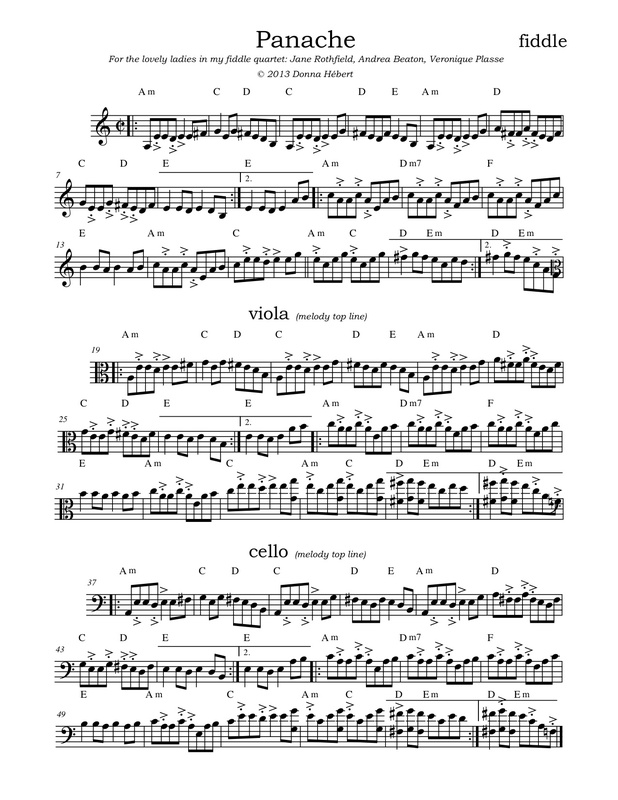 Forty-one tunes, with bonus viola and cello transcriptions and detailed bowings and chords. There are sixteen jigs (three are crooked! ), 14 reels, 8 waltzes, 3 airs, in styles from all over. 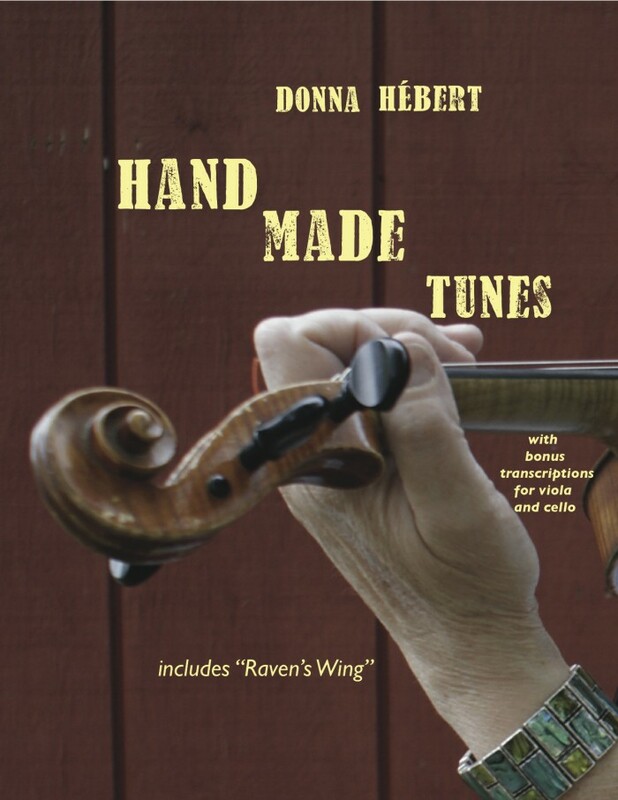 Includes Donna's Old-Time reel, "Brasstown" and the air, "Raven's Wing." A discography is included. Everything is styled in its native dialect in the notation, so an Irish-sounding melody shows Irish ornamentation and rhythm accents, and so on. These carry over into viola and cello charts. The second, often awkward but unavoidable, is the octave drop. The challenge here is two-fold. Fingerings can be difficult, making ornaments clunky at lower pitches. Then, shifting back to the original octave more elegantly, try using chord notes as alternates to melody, as harmony stepping-stones to mask the shift. The third method is what I’ve chosen to use most often in this book, giving the player the option of staying in the top octave. I show the melody as the top line (even if it’s in 5th position for viola and cello) with alternate notes given in a lower octave, keeping to the melody, OR playing a brief harmony note or two where the melody only briefly goes up. And of course, the fourth: when in doubt, play a rhythm groove over the chords and you can’t go wrong!